For those of our readers who I speak to regularly about a variety of issues, or for that matter, just to share a smile, last week was particularly busy. 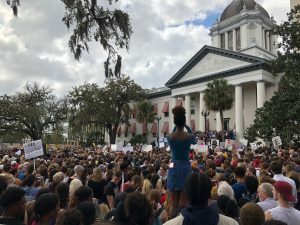 Thank you to all of you who called to see if I was ok…many expressing worry that the march on Tallahassee would get out of control and I would be in the middle of it. I was in the middle of it and I was inspired and moved to tears throughout the day. Below are some of the pictures of the rally taken by our Dylan Farley and fried Shawn Foster. I tried to put my feelings on paper but then read this: Jack Levine on the Parkland Massacre and much of what many are feeling is captured here. The author is a Democrat and I am a Republican and Jack and I will have coffee to see how we can work together. Hope you will do the same with someone “across the aisle” as we say in the Capitol. Blessings to all of you for a good and productive week. With ten days of the scheduled Florida legislative session left, Assignment of Benefits reform, elimination of Personal Injury Protection auto insurance, and Workers’ Compensation insurance reform are all looking increasingly doubtful, to put it optimistically. 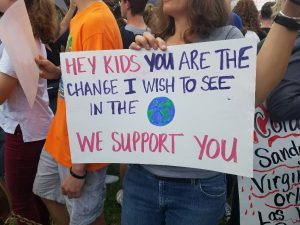 There was no discussion of substantive policy issues outside of education and opioid abuse from last Tuesday forward because of visits by the Parkland students and others advocating for gun control and greater school safety. The Governor responded with a $500 million proposal that includes raising the age from 18 to 21 to buy long guns (rifles) and to put at least one armed resource officer in every public school in the state. It’s significant that the Governor is willing to give up some tax incentives to do it. House and Senate leaders outlined their own proposals, which likewise include raising the age to 21 to purchase long guns and a measure that would allow teachers to carry concealed firearms in the classroom, under extensive training and direction of local law enforcement. A similar price tag of between $400 million to $500 million was mentioned by House Speaker Richard Corcoran. The Senate has session tomorrow morning, then begins an arduous 7-hour Appropriations Committee meeting with 43 bills on the agenda as of this writing. The House has various committees today and tomorrow, then begins session on Wednesday. With the exception of a short House Rules & Policy Committee meeting this Friday afternoon, it will be nothing but full sessions for both chambers from this Wednesday through the scheduled close of the session on the following Friday, March 9. By now, conference committees are usually well on their way but as of this writing, neither chamber has even named the conferees. These are the handpicked members of the House and Senate that serve as a negotiating committee to bridge the differences between each chamber’s $87+ billion state budget for the new fiscal year that begins on July 1. House Speaker Richard Corcoran last week accused Senate leaders of “stonewalling” on budget negotiations and acting like “kindergartners.” Senate President Negron replied that all is well and in the capable hands of professional staff – whom he noted have been around longer than the elected lawmakers. When they do start to talk, they’ll have $167 million less with which to negotiate. The state revenue estimating conference this past Friday revised an early February estimate, citing a decline in the state corporate income tax collections. Assignment of Benefits (AOB) – The Florida Senate’s version of AOB reform, SB 1168 by Sen. Greg Steube (R-Sarasota), did not make today’s Rules Committee agenda – a requirement before it can go before the full Senate for a vote. Today is the last scheduled meeting of that committee this session, so that leaves the Senate with the only option left of taking up the House bill, amending it, and sending it back to the House. Not likely. Compromise among insurance, legal, and contractor interests remains elusive. It just appears that special interests are going to prevail over consumer interests, with abuse by bad actors who continue to pocket ill-gotten gains. Meanwhile, Rep. David Santiago (R-Deltona), who has been a champion in the fight against the abuse of assignment of benefits for the past several years, has a catch-all insurance bill (HB 465), known as an “omnibus” bill to change several provisions of the insurance code. The bill has been revamped as CS/CS/HB 465 and still awaits a final vote by the full House. Previous changes to the original bill included elimination of a provision that would have excluded from the Department of Financial Services complaint registry complaints filed by third parties who are not satisfied with an insurance company’s claims handling when an assignment of benefits is involved. Among other non-AOB changes in this bill is the addition of the Intelligent Mail Barcode or other similar tracking methods used or approved by the United States Postal Service as an acceptable delivery method under a policy’s proof of mailing requirement. Majority Leader Ray Rodrigues questioned Rep. Santiago on the veracity of the process, noting it tracks a package to the mail center and then the mail truck, but not to someone’s home. Rep. Rodrigues said he knows from personal experience (and those of his neighbors) that mail mix-ups occur and said something as important as an insurance notice should have a traceable delivery abilities. Look for more discussion about this when the bill is debated on the House floor. A revamped companion, Senate Bill (CS/SB 784) by Senator Brandes passed its second committee last week with a unanimous vote by the Judiciary Committee but has not been scheduled for its final committee, Appropriations, meeting tomorrow. This committee could have additional meetings in the future, prior to the end of session. The bill now contains a provision that mediation may be requested only by the policyholder, as a first-party claimant; a third party, as assignee of the policy benefits; or the insurer. However, an insurer is not required to participate in any mediation requested by a third party assignee of policy benefits. Workers’ Compensation – Like AOB reform, Workers’ Comp reform is another issue that was fast-tracked by the Florida House while the Senate never produced a formal bill. Business groups’ support of the House effort has been lukewarm, saying it could be “premature and ultimately, inadequate” especially in restricting attorney fees. The House, on January 12, passed HB 7009 by Rep. Danny Burgess (R-Zephyrhills). It’s a near replica of HB 7085 from last session that died over disputes on maximum hourly attorney fees. This is by far one of the most contentious – and by court rulings, most immediate – issues facing the legislature after the state Supreme Court’s 2016 ruling that our workers’ comp system was unconstitutional. While the bill has had no Senate companion, Senate President Negron was quoted in January as saying his chamber is eager to pass something this session. This past week, the Senate Banking and Insurance Committee (the one that could have taken up Windshield AOB and didn’t) took up CS/SB 1568, which would eliminate a 2003 law that makes it a felony insurance fraud for anyone to knowingly present false or misleading information about their identities in obtaining employment. While it could have applied to illegal aliens, its sponsor Senator Gary Farmer (D-Ft. Lauderdale) added an amendment to clarify instead that the bill “is simply designed to ensure that workers who are injured on the job obtain the benefits they are due.” This was a ceremonial or “courtesy hearing”, as with no House companion bill or time left in the session, this bill is going nowhere. Workers’ Compensation for First Responders – CS/SB 376 by Senator Lauren Book (D-Plantation), will be heard tomorrow before the Appropriations Committee, but will most likely miss getting heard by its last committee, in Rules. The bill removes the requirement on some first responders that there be a physical injury in some circumstances in order to receive medical benefits for a “mental or nervous injury”, so long as the responder witnessed a specified traumatic event. These efforts are inspired, in part, by the city of Orlando’s refusal to pay such benefits to a police officer reportedly diagnosed with PTSD after responding to the Pulse nightclub shootings. Meanwhile its House companion bill, CS/CS/HB 227 by Rep. Matt Willhite (D-Royal Palm Beach) has one more committee stop left in the Government Accountability Committee, which is meeting today, and will consider the bill. SB 126 by Senator Victor Torres (D-Kissimmee), which would require treatment begin within 15 days, was never heard. Personal Injury Protection (PIP), also called No Fault Insurance – Efforts continue behind-the-scenes to put a bad-faith element in both the House and Senate bills that would do away with PIP insurance. But it appears more doubtful with each passing day that either bill will be passed by the full legislature. The bills under consideration would eliminate the state requirement that motorists carry $10,000 in PIP insurance and put responsibility for vehicle accidents on the party at fault. While the House has passed its PIP repeal bill and the Senate is working its version through the third of four committees this week, some insurance interests are withholding formal support because neither bill provides protections from bad faith lawsuits that will likely go with the territory of returning to a tort system. As a result, the future of PIP elimination remains unclear. The House chalked up a quick victory on January 12 with passage of HB 19. The bill eliminates PIP and would require motorists instead to carry Bodily Injury liability insurance at a minimum $25K/$50K level. Rep. Erin Grall (R-Vero Beach) who is sponsoring this bill for second year in a row, has noted that despite various PIP reforms in the past, costs keep going up, driven partly by fraud. OIR and committee staff analysis show auto rates would go down (5.6% overall) if the bill passes and should encourage those driving illegally without proper insurance (22% of Florida drivers she has said) to get coverage. The bill also revises the uninsured and underinsured coverage legal damage thresholds. The Senate’s answer to PIP reform will go before the Appropriations Subcommittee on Health and Human Services this Wednesday afternoon. CS/SB 150, by Senator Tom Lee (R-Brandon), goes beyond the House bill and replaces PIP with mandatory $5,000 of Med Pay coverage (and loses the consumer savings as a result) plus varying amounts of Bodily Injury liability limits which appears to give consumers choices. Senator Lee revamped his original bill to now focus Med Pay coverage solely on emergency hospital treatment and within two weeks after the accident. The bill was further amended to allow less expensive treatment by other practitioners, including chiropractors. Some senators expressed concern in a past committee that the bill will effectively raise auto insurance rates for those motorists who have just PIP policies. But Senator Lee refuted that, noting that mandatory BI will cost $49 per $1,000 of coverage versus the current $121 per $1,000 of PIP coverage. As an example, he said a scenario of PIP + minimum BI + Med Pay would cost just $4 more, proof of a more efficient system without PIP. Senators are facing pressure by Incoming Senate President Bill Galvano to “get ‘er done” this session before he takes over in the fall. A report out in early February by the actuarial firm Milliman says that eliminating PIP under the House’s already passed HB 19 would increase, not decrease coverage costs based on likely motorist scenarios. The Milliman Report, done for the Property Casualty Insurers Association of America, says an increase of 5.3% or $67 is likely under relevant variations in coverage and sample size, as more drivers will buy uninsured and underinsured coverage for protection against motorists who skip buying insurance altogether. The report says the increased costs result as well from the addition of non-economic damages under bodily injury and uninsured lines that don’t exist today under no-fault PIP. Combining HB 19 with the Medical Pay provisions of the Senate’s CS/SB 150 would see average coverage costs rise 6.4% or $80, said Milliman. Affordable Housing – Bills in both houses would create a Hurricane Housing Recovery Program and a Rental Recovery Loan Program to provide Florida residents funding for emergency housing and repairs after hurricanes. The programs would be funded by a 20% allocation (about $62 million this year) of the state’s existing Sadowski Affordable Housing Trust Fund. CS/CS/HB 987 by Rep. Bob Cortes (R-Altamonte Springs) will be heard on the House floor this week. A companion bill, SB 1328 by Senator Keith Perry (R-Gainesville), will be heard before the Appropriations Committee tomorrow, its final stop, before going to the full Senate. Health Care Disaster Preparedness & Response – A revamped HB 7085 by Rep. Ralph Massullo (R-Beverly Hills), a medical doctor from the small town of Lecanto, in Citrus County, passed the House Appropriations Committee this past Friday and was placed on the special order calendar and will be heard on the House floor on Wednesday. The bill addresses the shortage of special needs shelters during Hurricane Irma and expands the list of people – including health care students and college professors – who can help provide care during disasters. The bill directs the state Department of Health, in coordination with the Division of Emergency Management and local emergency management agencies, to maintain a statewide registry of persons with special needs; requires nursing homes, assisted living facilities, home health agencies and nurse registries to have an emergency management plan & to conduct staff training; reassigns responsibility from DOH to AHCA for establishing & maintaining online database for licensees providing residential or inpatient services to report information regarding emergency status, planning, & operations; and requires licensees to provide for continuation of services under emergency conditions. Trash Pickup – This bill will be heard by the Commerce Committee this afternoon. The House Energy and Utilities Subcommittee on January 29 passed CS/HB 971 by Rep. Randy Fine (R-Palm Bay) that would prohibit a municipal or private garbage service from charging customers for missed trash pickups, unless the trash is removed within three days of the normally scheduled date. The bill also prohibits telephone or cable companies from charging their customers for service that was interrupted for longer than 24 consecutive hours, unless it was the customers fault. The bill opened a broader discussion on the timing of garbage and yard waste both after and before a storm. Trash haulers who spoke said there should be no collection of garbage or yard trimmings 48 hours before a storm, as they can become projectiles in high winds. Afterward, in the case of Hurricane Irma in Jacksonville, one hauler testified many areas of the city were still flooded seven days later, preventing trash trucks from garbage pickup. Committee members expressed concern about the complexity of the bill and that it would create new costs that would inevitably fall on customers. Underground Utilities – Legislation (HB 405) already passed by the House giving the state Public Service Commission the sole ability to require underground transmission lines, passed the Senate last Wednesday and is on its way to Governor Scott for his signature. The move ends a court battle of home-rule by Miami-Dade County that wanted the right to determine underground transmission lines when it was reviewing FPL’s plans to add two nuclear reactors to its Turkey Point Generating Station. Senator Tom Lee, who had sponsored a companion bill in the Senate (SB 494), said the measure makes changes that essentially revert the siting process to what it had been for 45 years prior to the court ruling. Nursing Home Emergency Power – House Health & Human Services Committee Chairman Travis Cummings (R-Orange Park) is still working to develop the financial structure needed as part of new state Health Department rules that would require that long-term care facilities have back-up generators. The measure was prompted by the deaths of residents of a Hollywood nursing home that lost its air-conditioning system during Hurricane Irma. The rub is how to help fund the venture for the state’s 3,000 Assisted Living Facilities, which unlike nursing homes, cannot offset the cost with Medicaid funding. Any rule that increases the costs of state regulation by $1 million or more over a five-year period requires legislative approval first. Meanwhile, CS/SB 1874 by Senator Kathleen Passidomo (R-Naples) would require the Agency for Health Care Administration to adopt and enforce rules requiring each nursing home and assisted living facility to have an emergency power source and fuel supplies to last at least 96 hours during a power outage. The bill has passed only two of its four committees and is not on the agenda of tomorrow’s Senate Appropriations Committee. Fuel Emergencies – CS/HB 7083 features a number of the recommendations made in the House Select Committee on Hurricane Response and Preparedness report, with the primary focus though on better fuel delivery to Floridians during time of crisis. The bill passed the House Appropriations Committee last Thursday and is ready to be scheduled for a vote on the House floor. It requires a study to be completed by July 1 that would outline how rail tank cars and mobile fuel transfer systems could be used as temporary storage and dispensing facilities for motor vehicle fuels before, during, and after a hurricane. The measure was prompted by the run on gas and various shortages that occurred during the evacuation from South Florida during Irma. The Senate meanwhile, still has two more committee stops for CS/SB 700 that would create a Florida Strategic Fuel Reserve Task Force within the Division of Emergency Management. The task force would recommend by April 30, 2019, a strategic fuel reserve plan to meet the state’s fuel needs during emergencies and disasters. The state agriculture commissioner would be empowered to lower gas prices during an emergency under an amendment previously added to CS/CS/HB 553, a House omnibus bill on regulations by the Department of Agriculture and Consumer Services. The bill is ready for consideration by the full chamber. The measure’s specific intent is to require gas stations that run out of lower octane fuel to then sell their higher octane fuels at the lower octane price. In a prior committee meeting, a representative from the Florida Petroleum Marketers Association said the measure would place Floridians at greater risk of predatory pricing in the longer term, because the big oil companies can afford to sell 93 Octane gas at 87 Octane prices while the smaller mom and pop operators cannot. Representative Jamie Grant (R-Tampa) pointed out the measure would help consumers immediately prior to and after a disaster, when they need it most, in what was a very good debate among members. Hurricane Flood Insurance – There are other bills prompted by Hurricane Irma’s aftermath. CS/SB 1282 by Senator Taddeo (D-Miami) passed the Rules Committee this week and is ready for a hearing in the full Senate while CS/CS/HB 1011 by Rep. Janet Cruz (D-Tampa) has already passed the House. The bills were prompted by two realities: upwards of 60% of Irma’s damage here was caused by water and up to 80% of Florida flood victims may not have either NFIP or private flood coverage. The bills would require homeowners insurance policies that do not include flood insurance (most don’t) to so declare and would require policyholders to initial that declaration in acknowledgment. “It will save a lot of trouble for homeowners,” Senator Taddeo told the Senate Community Affairs Committee mid-February, prior to its passing her bill. “After Hurricane Irma, a lot of homeowners were calling my office saying that ‘My insurance isn’t covering this’,” she said. CS/SB 1282 contains two amendments that 1) require the policies to acknowledge that private flood coverage is available for those homeowners with property valued above the National Flood Insurance Program’s $250,000 coverage limits; and 2) push the effective date of the measure to 2019 to allow insurance companies enough time to change their forms. The passed House bill removed the specific reference to the National Flood Insurance Program. Florida Hurricane Cat Fund – An effort to return a portion of property insurance premiums to policyholders during quiet storm years is facing a doubtful future. SB 1454 by Senator Jeff Brandes (R-St. Petersburg) passed its first hearing last week before the Senate Banking and Insurance Committee but has run out of time. Like the House bill below, it would accomplish savings, but more quickly, by eliminating the rapid cash build-up factor resulting in immediate rate savings. “This bill is eliminating a hurricane tax on hardworking Floridians,” said Senator Brandes. The House bill, CS/HB 97 by Rep. David Santiago (R-Deltona) was not scheduled for today’s final Commerce Committee, a necessary step to reach the House floor. The bill, as does the Senate’s, addresses the growing balance – until Hurricane Irma – of the Florida Hurricane Catastrophe Fund. The Fund provides reimbursements to insurers for a portion of their catastrophic hurricane losses. Insurers pay premiums into the fund each year and pass the costs along to their policyholders, just like reinsurance. But in quiet years, the fund has grown beyond its current statutory requirement of $17 billion, prompting the question: Should you reduce collections and thereby reduce premiums to policyholders? Jay Neal of the Florida Association for Insurance Reform supported the bill at previous committee meeting, noting the average policyholder pays an extra 4% now for the rare possibility of a catastrophic event. “When fund balances are high, we don’t see the need to have the assessment and instead let the consumer spend that money elsewhere in the economy,” he said. Direct Primary Care – This is an issue that’s down to the wire. CS/SB 80 by Senator Lee, passed by unanimous votes in October out of the Banking and Insurance, as well as the Health Policy Committees, is finally getting its last committee hearing tomorrow before the Senate Appropriations Committee – on the last day it’s scheduled to meet this session. The Senate bill, like its House counterpart, is informally dubbed “concierge medicine for the masses”. HB 37 by Rep. Danny Burgess (R-Zephyrhills) passed the House on January 25. The bill allows doctors to enter into monthly fee for service arrangements directly with individuals or employers, essentially bypassing health insurance organizations. Burgess, in explaining the bill on the floor, said a lot of doctors don’t enter direct primary-care agreements because of regulatory uncertainty. The bill would make clear direct primary care is not subject to insurance regulations. Burgess said the agreements are more affordable than insurance (typically costing about $75 month) and co-sponsor Rep. Mike Miller (R-Winter Park) said the bill gives the “ultimate decision-making process” to doctors and patients. “We’re trying to lower the cost of health care and improve the outcomes,” he said. Two amendments which would have essentially added Obamacare provisions by preventing a primary care practice from declining a new patient because of health status or discontinuing care to an existing patient due to health status, as well as eliminating refunds to an employer paying on behalf of an employee, directing the refund go instead to the patient – failed to pass. Health Insurer Authorization – This is another issue that’s down to the wire. While CS/CS/SB 98 by Senator Steube was passed by the Senate on January 31, its House companion CS/CS/HB 199 by Rep. Shawn Harrison (R-Tampa) has one more stop – the House Health & Human Services Committee which meets for a final time tomorrow, but it’s not clear the bill will be on the agenda. The bills collectively would require insurers and Medicaid HMOs to approve or deny prior authorization requests as well as appeals from denials of care within three days in non-urgent situations and one day if the care is urgent. It would also prohibit prior authorization forms from requiring information not necessary to determine the medical necessity or coverage for a treatment or prescription. Health insurers and their pharmacy benefits managers would also have to provide requirements and restrictions on prior authorizations in understandable language and to make them available on the internet, along with a 60-day notice of any changes. It also defines “step therapy” and prohibits insurers and HMOs from requiring patients repeat step therapy protocols. In recognition of the current opioid crisis, the Senate previously approved an amendment requiring insurers waive step therapy requirements if the treatment being recommended is a non-opioid alternative. Past testimony on CS/CS/HB 199 included a schizophrenic patient testifying that getting on the right medication and staying on it are crucial. She hinted she had to start over with step-therapy protocols when her psychiatrist of 10 years retired. Denying a drug, even temporarily, she said, can lead to hospitalization and death. A representative from America’s Health Insurance Plans warned that disregarding step therapy protocols could impact patient safety. An amendment was added that clarified that this applies to insurance in both small group and large group plans. There was a question on whether this will increase rates for consumers. Rep. Harrison said possibly, but that it hasn’t happened in other states with this requirement. Payment of Health Care Claims – Senator Steube is also sponsoring SB 162 that would prohibit health insurers and HMOs from retroactively denying insurance claims under certain circumstances. The bill was temporarily postponed on the Senate floor. Meanwhile, its House companion, HB 217 by Rep. Bill Hager (R-Delray Beach), has one more stop – the House Health & Human Services Committee which meets for a final time tomorrow, but it’s not clear the bill will be on the agenda. Past “yes” votes by members of the Appropriations Committee vowed to vote “no” if the bill isn’t improved during the last weeks of session. So provisions of these measures are still in play and will depend on the intestinal fortitude of its sponsors whether either makes it across the finish line. The House bill, as does SB 162, would require that insurers verify a patient’s eligibility at the time of treatment to avoid doctors performing services that are later denied with insurers demanding repayment from the doctor or patient. The debate on the bill has turned into a debate on the federal Affordable Care Act (Obamacare) because the bill would apply to policies both on and off the federal exchange. Obamacare requires a three-month grace period on federal exchange policies as long as the patient paid at least one month’s premium. During the first month of the grace period, an insurer must pay all claims – during months two and three, insurers can notify providers that claims may be denied. Insurance groups, such as the Florida Association of Health Plans, opposed HB 217 during the meeting as simply codifying Obamacare into state law, given it would apply to both on- and off-exchange health policies. The bill has one final, yet unscheduled, stop before the House Health & Human Services Committee. Telehealth – Efforts to bring telemedicine to full fruition are on life-support. CS/SB 280 by Senator Aaron Bean (R-Fernandina Beach) passed the Appropriations Committee last week, its final committee, and is ready for consideration by the full Senate, but its House counterpart never got a hearing. Senator Lauren Book (D-Plantation) told a previous committee she recently used the Facetime video application on her phone to remotely link one of her children with their dermatologist for treatment of hives and she heartily endorsed the concept. The bill is part of a continued effort to put remote health practitioner visits via the internet on an equal footing as in-office visits, in order to reduce health costs and provide parity of care to rural patients. A state panel in 2016 executed a list of legislative directives to help smooth the kinks and establish recommended procedures to help make this bill a reality. SB 280 would establish the standard of care for telehealth providers; encourage the state group health insurance program to include telehealth coverage for state employees; and encourage insurers offering certain workers’ compensation and employer’s liability insurance plans to include telehealth services. The bill would also ban the use of telehealth for prescribing controlled substances to treat chronic or nonmalignant pain or for certifying patients for medical marijuana treatment. A companion, HB 793 by Rep. Massullo, was filed in late November and never received a hearing and so is dead. Texting While Driving – Senate Appropriations Chairman Rob Bradly (R-Fleming Island) was quoted this past week as having serious privacy concerns over a bill that would move Florida’s current ban on texting while driving from a secondary offense (where you can be ticketed during a traffic stop made for another reason) to a primary offense. So SB 90 by Senator Keith Perry (R-Gainesville) hasn’t been scheduled for the Appropriations Committee tomorrow, a required last stop before it is heard by the full Senate. Meanwhile, the House is schedule to vote this week on its counterpart, CS/CS/HB 33 by Rep. Jackie Toledo (R-Tampa). It includes an amendment its Senate companion previously adopted requiring that the driver’s race and ethnicity be recorded by law-enforcement officers when ticketing for texting while driving. The amendment passed out of concerns about racial profiling of minorities. Under the bill, first-time violators would face a $30 fine plus court costs for a non-moving violation. Second-time offenders would face a $60 fine plus court costs with a moving violation. Those involved in crashes or texting in school zones face additional penalties. Both bills require the officer notify the driver of the constitutional right not to have their cellphone examined by authorities. Neither applies to stationary vehicles. Florida is one of four states where texting while driving isn’t a primary offense. Controlled Substances – While a just revamped House bill comes up for a full floor vote this Wednesday, its Senate counterpart still hasn’t been scheduled for a floor vote. Governor Scott’s office is driving this train and so the question remains where both bills will end up. This past week, the House Health & Human Services Committee approved an amendment to HB 21 by Rep. Jim Boyd (R-Bradenton) that changed the bill from a two-tier to a three-tier prescription system for opioid prescriptions. Patients with cancer or terminal illnesses and certain trauma patients would now be exempted from prescription limits. The bill would limit those with acute pain to a three-day supply. Doctors could go beyond that to a seven-day prescription for those determined medically necessary and the doctor would be required to write “acute pain exception” on the prescription. 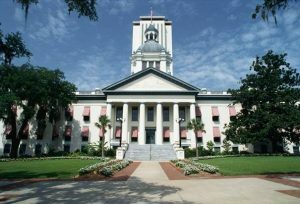 The Florida Orthopaedic Society remains opposed to the bill, with concerns noted by the Florida Medical Association. Meanwhile, SB 8 by Senator Lizbeth Benacquisto (R-Ft. Myers) remains shelved from a full Senate vote after final committee approval two weeks ago and ongoing behind-the-scene talks among the Florida Medical Association and key lawmakers and the Governor’s Office. Both it and the House bill provide for more continuing education for responsibly prescribing opioids and requires participation in the Prescription Drug Monitoring Program by all healthcare professionals that prescribe opiates. It specifically requires doctors to check the database before writing prescriptions, to avoid enabling “doctor shopping” multiple-prescription patients. The Senate’s budget provides $53 million for the treatment and prevention of opioid addiction. The House bill would also authorize the state Department of Health to share data with other states to avoid patient abuse in filling multiple prescriptions. The House earmarked about $50 million to address the opioid crisis, with more than half of that to come from federal funding. The House also wants to spend $1 million on the statewide prescription drug database. Trade Secrets in Public Records – CS/HB 459 & CS/HB 461 by Rep. Ralph Massullo (R-Beverly Hills) passed the House last week and are on their way to the Senate. These bills have not had a single hearing in the Senate which appears to indicate this subject will be a source of negotiation as we near the end of session in the next two weeks. The bills together eliminate trade secrets and its various definitions found in statutes and then restore them under a uniform definition and treatment. On February 16, three additional amendments were filed by Rep. Massullo, one of which would keep in place the bill’s proposed elimination of public records exemptions for certain information that might reveal trade secrets held by the Department of Legal Affairs but take out previously proposed elimination of similar public records exemptions for trade secrets held by the Office of Insurance Regulation and future trade secret documents submitted to the Department of Financial Services or the Office of Insurance Regulation. Scenario-based Modeling for School Shootings? In the aftermath of the Parkland school shooting, there will almost certainly be civil lawsuits against the school district and other organizations and individuals that insurance will likely be involved in defending. How do you contemplate and rate the risk of such an event? This newsletter has updated readers on new modeling and technology that’s been a game-changer on the property side in bringing more private companies to write flood insurance in Florida. Now, there’s a new effort to use modeling on the casualty side. AIR Worldwide, a Verisk company, is modeling such “systemic” or sudden events that impact different insurance lines, and explains how in this recent Claims Journal article. A new report out by the Florida Justice Reform Institute provides the latest evidence that Florida’s Assignment of Benefits (AOB) system is broken and pins the blame squarely on a system that incentivizes vendors and trial lawyers to strip rights away from policyholders in order to make a buck, which is inflating insurance premiums for Florida’s consumers. Those AOB lawsuits filed last year represented more than half of all insurance litigation on the dockets – and it’s growing. The Institute (FJRI) report states that lawsuits against insurance companies involving an AOB increased 58% between 2015 and 2017 (from 82,263 to 129,781). And it’s not just homeowners property claims suits. Automobile windshield claims suits have grown from 397 in 2006 to 19,513 in 2017, according to the state Department of Financial Services. The report blames aptly-named “no-risk proposition of attorney fees” as the culprit. Think about it. If you were a lawyer and knew you could get attorney fees awarded if you won just $1 more than the insurance company’s initial settlement offer, wouldn’t you take the case? Various bills in the Florida Legislature to reform this abuse are stalled (see this edition’s Bill Watch). FJRI found that about a dozen lawyers contribute to a quarter of all AOB litigation statewide. The report also provides insight into why insurers have been unsuccessful using the offer of judgment/proposal of settlement statute to control these rising litigation costs. “Litigation reform is necessary to prevent policyholders from losing their rights to proper repair and to stop the double-digit premium increases that we will all pay for,” said William Large, FJRI President. Folks, there’s one thing that’s clear to me after reading the FJRI report. AOB in Florida, in its current form, has become a weapon harming consumers who pay for this insanity. In private conversations with lawyers, many agree that what is happening is wrong and if the problem is that insurance companies “just don’t pay,” then it just makes sense to use the Department of Financial Services FREE helpline and consumer assistance specialists to mediate the claim dispute to avoid the lawsuits and the lawyers who perpetrate them. 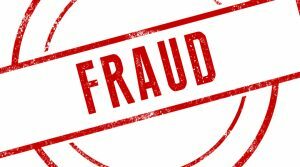 If you have been a victim of an AOB scam where a vendor took your policy rights and you feel helpless or feel like your insurance company did you wrong, please call me at 850-528-9229 and I can guide you to free help from insurance regulators. While the Florida legislature considers bills to toughen enforcement of the ban on texting while driving, a new study shows that a third of teenage drivers in the nation – a prime focus of the bills – routinely ignore similar laws in other states. The study urges a ban on hand-held calling, which has produced better compliance with distracted-driving laws. Our children are precious, as we were reminded in the recent Parkland school shooting. Yet in 2016, nearly 1,600 people were killed in Florida and another almost 79,000 injured by distracted driving – some of them children – and represent double-digit increases from the year before. The study by the Center for Injury Research and Policy at Nationwide Children’s Hospital, looked at the effectiveness of state laws in reducing teens’ use of cellphones while driving. The researchers found significant differences based on the types of bans (texting only vs. hand-held phone conversations) and whether the ban applied to just young drivers or all drivers. Bans of both types limited to just young drivers weren’t as effective as those on all drivers. Texting bans on all drivers showed about one-third of teens still texted, while bans on hand-held phone conversations revealed 55% fewer teen conversations compared to states with no bans. “Nearly all states ban texting while driving, however, these bans are not effective. More states should implement hand-held cellphone bans, which have been proven to discourage hand-held cellphone conversations while driving,” said Dr. Motao Zhu, the study’s lead author and the Center’s principal investigator. The study was published recently in the Journal of Adolescent Health. Florida is one of four states where texting while driving isn’t a primary offense. The House bill that makes it a primary offense (meaning you can be pulled-over just for texting) is scheduled for a floor vote this week, while the Senate bill still awaits to be heard in the Appropriations Committee before it can move to the full Senate. “Drive-by lawsuits” are common among those who use the Americans with Disabilities Act (ADA) as a weapon against commercial property owners threatened that they are out of compliance. A bill that passed the U.S. House last week, entitled ADA Education and Reform Act, H.R. 620, would require plaintiffs who alert property owners to a potential accessibility violation under the ADA to give them 60-days’ notice and then another 60 days to either fix the problem or have a detailed plan to do so. The bill takes aim at a practice in which complainants, typically with help from legal counsel, send a demand letter threatening commercial property owners with a lawsuit for an alleged accessibility violation, like an incorrect slope in a parking lot or faded signage that would be hard for a visually impaired person to read. 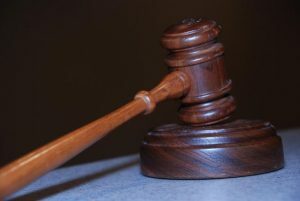 Owners are told to pay a fee to the complainant, typically around $5,000, to avoid having to defend themselves in court, without addressing the merits of the allegation. Owners refer to these as “drive-by” lawsuits because the plaintiffs send out letters to dozens of property owners without necessarily visiting the properties to determine if, in fact, there’s a violation. One real estate association conducted a 2016 survey of its members and found that more than a third of them have been hit with a demand letter of this type, and most paid a fee to settle out of court to avoid the expense and time of a lawsuit. The similarities to these drive-by lawsuits and the current AOB crisis is not surprising. In the AOB insanity, insurance companies are slammed with hundreds of lawsuits, many that are small dollar amounts, so the plaintiff’s lawyer can “settle” and get their cut of the suit. One bill in the legislature gives insurance companies 30 days to work the claim before a suit can be filed, much like this national legislation provides 60 days+ to cure the alleged ADA violation. Yet in the Florida legislature, no such bipartisan support exists to cure the AOB problem. The National Association of Realtors and others are working on a bill introduced in the U.S. Senate to address this ADA issue. As we prepare for the week ahead, I am reminded what my mama used to always say when I seemed puzzled or wondering about “what’s next”? She would say, “meet people where they are…” and while I lost her at the young age of 59 (I was 27 when she lost her battle to cancer), that saying has stuck with me. I wonder where you are on the Parkland debate. We have heard all week with the crescendo on yesterday’s (Sunday’s) talk shows and the announcements of our leaders on their ideas to stop yet another mass shooting. As a matter of fact, the Florida legislature is considering sweeping criminal justice reform to reduce mandatory minimum sentences, implement arrest diversion programs, and try a computer-generated “risk assessment” tool to determine one’s violent propensities, patterning these ideas after Pinellas County’s offender diversion programs that have been in place for a while. LMA Newsletter readers are REALLY smart people so I welcome your thoughts and I will share them far and wide as I engage on this and other issues. Thanks for your unwavering support.